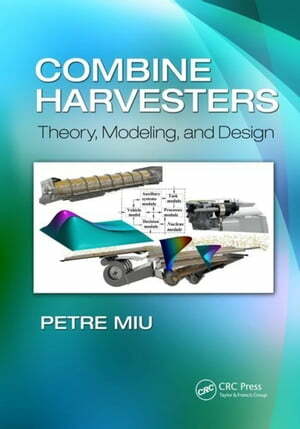 Collins Booksellers - Combine Harvesters: Theory, Modeling, and Design by Miu, Petre, 9781482282375. Buy this book online. A culmination of the author's more than 20 years of research efforts, academic papers, and lecture notes, Combine Harvesters: Theory, Modeling, and Design outlines the key concepts of combine harvester process theory and provides you with a complete and thorough understanding of combine harvester processes. Utilizing a wealth of experimental data to promote validated mathematical models, this book presents the latest stochastic and deterministic modeling methods, evolutionary computational techniques, and practical applications. Highly focused on engineering and mathematics, it incorporates the use of simulation software (including MATLAB®) throughout the text and introduces a unified approach that can be used for any combine harvester functional structure. The book addresses modeling, simulation, evolutionary optimization, and combine process design. Breadth of coverage includes general technical specifications, developing machine layout as defined by engineering calculations, and design considerations for major subassembly processes. Combine Harvesters: Theory, Modeling, and Design contains principles, calculations, and examples that can aid you in combine process modeling and simulation, the development of combine process and driving task-based control systems by considering a top-to-bottom design of combine assembly and components.